New Delhi: When a group of 46 cooks in northern Gujarat—some of whom had been working for up to seven years—demanded full payment for their labour, they were threatened, beaten, then finally thrown out with little more than the clothes they were wearing. The group—which included women and children—were all migrants from a tribal region in southern Rajasthan. They walked for three days without food to get to the nearest train station, selling their mobile phones and tribal earrings to buy tickets to return home. They are still collectively owed nearly ₹ 72,695. That’s the kind of situation that Rajiv Khandelwal, founder of migrant-rights NGO Aajeevika Bureau, sees every day. There was the Rajasthani construction worker whose boss pocketed his salary and disappeared, leaving him broke, and in debt. Or the headloader in Surat who was issued a death threat when he notified his boss that he wanted to go home to visit his family he hadn’t seen in two years. He left anyway, but never made it home. His body was found eight days later. The case is still unresolved. Lacking legal identification, permanent residency, formal work documents—often even birth certificates—India’s 100 million migrants are effectively denied the legal protection afforded to workers in the formal sector. As outsiders without local identification, they are often the first to come under suspicion over crimes in urban areas. Because they largely work in the informal economy, without legal contracts or unions, far away from the social support structure provided by family and acquaintances, they are frequent victims of abuse and exploitation. Often lacking even birth certificates, they are unable to access education for their children, proper housing or healthcare. Without bank accounts—thereby lacking any way of securely saving money or sending it home—many retain cash with their employers, who use it as another means of exploitation. It’s unsurprising then that India’s 100-120 million migrant labourers—for whom identity is the first step towards social integration—are one of the populations with the most to gain from India’s unique identity (UID) programme. “UID is trying to link identity with services. For migrants, identity itself is a service," said Khandelwal. “People don’t have identity so they get harassed and discriminated against. So we are less concerned with how UID can be leveraged to access services and more concerned with just giving people a credible verification." The Unique Identification Authority of India (UIDAI) aims to issue ID numbers to 600 million citizens over the next four years. UID numbers are to be linked to new bank accounts, government programmes such as the Mahatma Gandhi National Rural Employment Guarantee Scheme (MGNREGS) and the public health distribution system—benefits that migrants often have great difficulty accessing. Since the government signed off on UID in January 2009, UIDAI has issued more than 900,000 UID numbers to Indians of different backgrounds—from villagers in remote Maharashtra to homeless people in urban New Delhi. 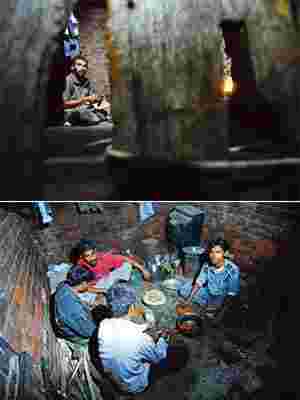 But their strategy to reach out to India’s migrant workers is still in its infancy. In July, UIDAI signed a memorandum of understanding (MoU) with a coalition of 23 migrant-related NGOs agreeing to work together to ensure that migrants are included in the programme. But how exactly that collaboration will play out is under discussion. “We are still working out the details," said Raju Rajagopal, a UID official tasked with the job to make certain that marginalized communities—including tribals, migrants and homeless—are included under the programme. “We are hoping that organizations will help to tell migrants about UID, as it is within their best interest that all migrants receive numbers." Aajeevika Bureau’s Khandelwal is one of the founders of the NGO coalition and its principal signatory for the MoU with UIDAI. Since it was founded in 2005, Aajeevika Bureau has been issuing identification cards to migrants as a means of bringing them into mainstream. They also provide migrants with other essential services—enrolling them in government schemes and insurance programmes, and providing legal aid at migrant service centres at source and destination sites throughout rural Rajasthan and urban Gujarat. Since they started issuing identity cards nearly five years ago, Aajeevika Bureau has issued more than 47,071 cards to migrants along the Rajasthan-Gujarat corridor. The cards, which include migrants’ home addresses (where they originally hail from), their skill level, a health hotline number and “emergency contact", are issued at source and destination sites. Because Aajeevika has the cards signed by the local panchayat, they are recognized as legal documents. After enrolling the first 10,000 local migrants, the Rajasthan government began recognizing it as an official government ID. Almost immediately after receiving a card, migrants report a drop in police harassment, according to Khandelwal. A few have been able to use it to open bank accounts. Some have used it to vote. According to Khandelwal, one of the biggest challenges in reaching migrants is their lack of any fixed address. Most of the migrants lack voter ID cards because they are often away working for six-eight months of the year, and miss drives at source and destination. It was only after intensive outreach at source and destination sites that Aajeevika was able to issue them cards. Because they are viewed as outsiders, many migrants are also denied services—told by authorities to go home and seek them in their villages. “Making sure migrants are included is a very real issue, which is why we’re partnering with NGOs," said Rajagopal. “Some states are so parochial that if a Bihari shows up in Maharashtra to get enrolled they’ll send them back. So we really need to push the state that they should register a Bihari worker and give him a UID." For migrants, however, identity is just the first of many steps to social integration. Merely establishing identity is not always sufficient to access critical services. According to Khandelwal, even with proper documents and identification, actions such as opening a no-frills bank account—something the UIDAI has said would be its top priority in issuing IDs—depends largely on the whims of the local branch manager. “Branch managers can decide whether or not they want to accept the identification card," he said. “Even with UID, it will be difficult—there isn’t much profit in enlisting migrant workers because the transactions are very small. Bank managers need to be sensitized if it’s going to work." Despite the 47,071 Aajeevika cards issued, only 924 migrants have been able to use the card to open a bank account. Another very real need that all migrant workers have is for legal protection and labour rights. A survey conducted by Aajeevika Bureau found that 68% of migrants have reported serious work grievances against employers in the past year. Without formal verification, many migrants are unable to prove that they even worked for someone, should a dispute arise. Most transactions are informal, by word-of-mouth, and so migrants are very easily exploitable by employers. Stories of stolen wages, threats and beatings are commonplace. It’s a problem that’s very real for India’s migrant workers, and one that mere identification cannot easily resolve. “There’s an inter-state migrant workers Act, but there’s no mechanism for implementation, particularly for those who are inter-state migrants," said Rajendra Sharma, the Aajeevika Bureau’s services coordinator for the legal clinic in Gugunda block in rural Rajasthan. “The moment they pass a state border, they will find it nearly impossible for their disputes to be heard." Along with labour disputes, police harassment is a nearly ubiquitous complaint among migrants without photo identification cards. Bhagwan Singh, a migrant labourer from rural Rajasthan who works in Ahmedabad, said prior to getting an Aajeevika identification card, he was consistently stopped by police anytime a crime was committed. “They think we’re terrorists," he complained. “They throw people in jail overnight if they can’t show identification—they have to call their boss to get them out in the morning." Because UID is only a number, without a card or photo identification, such problems will not be easily resolved for migrant workers through UID alone. “UID doesn’t protect against police harassment. The Aajeevika Bureau ID does," said Khandelwal. “The need for a photo ID is not substitutable. The need for our card will not go away, but when combined with UID, it will be very powerful." This is the first of a two-part series on the plight of migrant labourers in India. Next: Locked out of the banking system.